at 6:30 p.m. - usually in the Chapel. for updates and meeting details! Our Divine Street UMW are known for their efforts in ministry to women, youth and children around the world. From donations to hands-on work in the community, you are likely to see our women quietly making a difference in the lives of others. 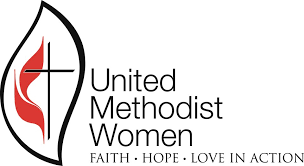 ​A typical gathering of UMW will include devotion time, an ​interesting program, and planning efforts for upcoming projects - all designed to speak especially to the heart of women! e work for justice through compassionate service and advocacy to change unfair policies and systems. The cross and flame are ancient symbols of the church and appear on The United Methodist Church emblem. The cross reminds us to follow in the steps of Jesus in our lives. ​​As United Methodist Women, we give our gift of God with others through mission. Our emblems reminds us of our purpose (see below) of growing in our understanding of and willingness to participate in the global ministries of the church. The overall fluid and free flowing shape of the emblem suggests change and mobility. Our foremothers were advocates for change; change and growth continue to be at the heart of United Methodist Women's sisterhood and mission.